Well, I did it -- AND, I did ahead of schedule. I covered the whole canvas during class on Monday night. Whoo hoo! Of course, that could all change next week because the painting I ended with wasn't exactly complete in that the drape had stripes which I edited out because of time. so, I made it but barely. I'll be posting it when I get a chance to take a photo of it. I leave too early in the morning so taking a pic at that time isn't going to work. Also, the painting goes to the edges so I can't easily carry it around. I'll check it tomorrow to see how wet the surface is. If it works that I can carry it, I'll take it to school and photograph it there. Otherwise, I'll have to wait until the weekend. I'm curious to hear comments, so stop back! As you can see from this most recent painting from my Monday night still life class at Fleisher, I'm still struggling with speed and economy in the a la prima approach to oil painting. I think I'm making progress, though. I feel much more confident in handling large compositions such as this. My previous efforts usually would have me focusing on a section of a larger composition. Opening myself up to seeing in new ways and experiencing this new way of recording what I see have already positively affected me. I'm excited about that. I wish I had the opportunity to paint between my Monday sessions. I'll have to speak to the wifey about making the time for that to happen (either inside or outside). Or, I'll have to do something about it at night. But, who knows, this growth may simply take more time. That's not my plan, but you've heard of the best laid plans of mice and men, right? I had class again tonight at Fleisher. Overall, it went well. I'll post the painting in another day or so (I need time to take a good pic of it). One of the great frustrations for me is that I'm not working fast enough. In an effort to challenge myself, I've been choosing to paint the ENTIRE still life. That means I'm not finishing things up before the end of class (thus, my last painting isn't complete). One of the great joys for me is that I'm enjoying this new style of working (a la prima). Overall, I'm finding it challenging but also very rewarding. I've got a lot of issues to work through as I push to embrace a la prima painting but I'm confident that I'll get there. Actually, I'm quite excited to get there! So, tomorrow or Wednesday, I'll post my painting from tonight. 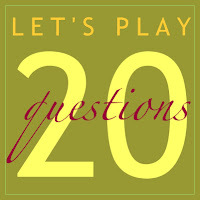 I look forward to your comments. 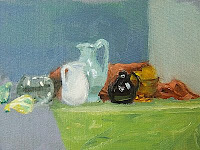 The above painting was my most recent work from my a la Prima Still-Life in Oils class over at Fleisher in Philly. As indicated in my post on October 13th, I had a much more enjoyable experience in class than during my first class. The teacher, Giovanni Casadei, spoke to me repeatedly during the 3 hour class about what I was doing. It proved helpful and I appreciated that attention. Ocassionally, he waxed eloquent on the importance of feeling connected to your subject which does resonate with me as an art educator though the way he talks about it sounds more like new age religion than art education. LOL! Overall, I really enjoyed painting this still life (particularly the fruit). My only regret is not having the opportunity to finish it. The background is missing and that destroys the unity of the piece. I made the mistake of getting too detailed in the beginning and didn't pace myself well. This coming Monday, I'm going to push to block in everything. As I indicated in my October 13th post, I am finding this approach to working (i.e., a la prima) a real challenge and that's primarily because of a fear of failure which surprises me because I tell my students that if you're not willing to make mistakes you're not going to progress and art will always be a frustration for you. Hmmm, I'll have to post on that. Comments on the painting anyone? 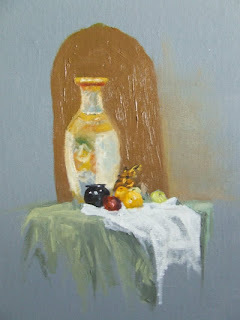 This is my first painting from my A la Prima Still-Life in Oils painting class at Fleisher. I wasn't happy with it; so much is wrong with it. 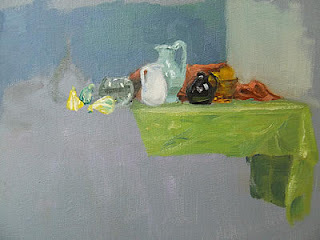 As you'll see in my second painting, I tackled more of the whole still life which made me happier. I think it is just a new way of thinking and working that completely threw me. I have to say that I like working on a gray ground. The canvas texture gave me some issues. I'll have to look into getting some smooth panels to work with. I came home from my second class at Fleisher last night and I have to say that tonight's class was SO much better an experience for me than last week's session. Giovanni came over and spoke to me almost immediately after class began. I'm sure he realized that I wasn't happy last week. He encouraged me to not look at the act of painting as a rote script to follow; technique being a stale end in itself. He also spoke quite passionately about "feeling" what you paint and loving the experience of painting. The act of learning to see is critical to my way of thinking. It's the foundation of what I'm trying to accomplish with my students at school. That's the reason I took this class at Fleisher in the first place. I want practice in capturing what I see in the moment of seeing it. I'm excited about next week's class. Let's hope I can reinforce what I took away from last night's class. Well, I started my new class this past Monday over at Fleisher Art Memorial. 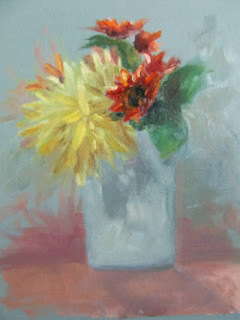 It's the a la Prima Still Life in Oils class with Giovanni Casadei. I really like his work, but his teaching style during the first class wasn't what I expected. I had hoped for a little demonstration, but Giovanni says he really can't do that because his working practice requires him to get into the zone. He also seemed to think it would interfere with me expressing myself and "feeling" my way through my work. I can appreciate what he is saying, but I figured he would at least give a simple demonstration of technique. So that was disappointing. I arrived on time, but that was apparently a little too late because I ended up having to take a position that was less than optimal considering how he had things set up. Frankly, I don't think this should ever be the case. If you're going to have a painting class with a still life then make sure you set it up so all members of the class will have a reliable angle to work. Of course, every angle may not be equal but they should all be workable. According to Giovanni my angle really wasn't and he recommended that I get there earlier to get a better spot. Okay, I can do that, but doesn't that mean that someone will always get a poor angle and will have to get there earlier? In my mind, he as the teacher should ensure that everyone has a place to sit that he can help them manage their composition and their approach to the subject. If he can't constructively provide feedback beyond "come earlier and get a better spot" then he needs to adjust how he has things set up. Of course, I'm not counting the class out. This is simply a report after my first class. I'll post more (and my first painting) from last week later this weekend.